This article is about the river in Tasmania Australia. For the river in England, see River Tamar. The Tamar River/kanamaluka is a 70-kilometre (43-mile) estuary located in northern Tasmania, Australia. Despite being called a river, the waterway is a brackish and tidal estuary over its entire length. Formed by the confluence of the North Esk and South Esk rivers at Launceston, the Tamar River/kanamaluka flows generally north towards its mouth at Low Head, north of the settlement George Town and into the Bass Strait via Port Dalrymple. The Tamar River/kanamaluka has several minor tributaries including the Supply River. Low Head Lighthouse is located at the tip of a peninsula, on the east side of the mouth of the Tamar River. The only full crossing of the river is the Batman Bridge in the relatively remote area of Sidmouth, around halfway up the river. Although the Port of Launceston is now used very little in comparison to the past and the SeaCat Tasmania ferry no longer docks at George Town, the river still is used for shipping, with light and heavy industries at George Town including aluminium smelters as well as commercial boat cruises. The Tamar River was named after the River Tamar in South West England by Colonel William Paterson in December 1804. 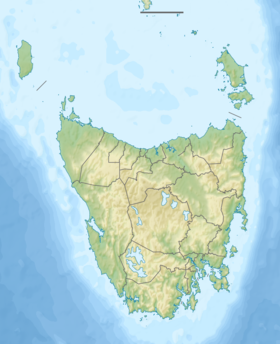 ^ a b "Map of Tamar River, TAS". Bonzle Digital Atlas of Australia. 2015. Retrieved 18 June 2016. ^ "George Town Council". georgetown.tas.gov.au. ^ "The Development of the Port of Launceston". Launceston Historical Society. Archived from the original on 2009-09-30. ^ "Bass Strait Passenger Ships and Passenger/Vehicle Ferries". users.nex.net.au/~reidgck. ^ "Tamar River Cruises". tamarrivercruises.com.au. ^ Bladen, F. M. (Frank Murcott), ed. (1897). Historical records of New South Wales, Volume 5—King, 1803-1805. Sydney: Charles Potter, Government Printer. p. 497. This article a river in Tasmania is a stub. You can help Wikipedia by expanding it. This page was last edited on 7 March 2019, at 13:04 (UTC).